The Native Tradition, Environment And Community Health (TEACH) Project began in 2008 with a collaborative grant supplement funded by the National Institute for Environmental Health Sciences (NIEHS). The grant funds were shared between EDGE-- then called the Center for Ecogenetics and Environmental Health (CEEH) and the Northwest Indian College (NWIC), our partner on the project. After 2008, the work was supported by the EDGE Community Outreach and Ethics Core and the Tribal partnerships that the project helped foster. In 2013-14, a new NIEHS collaborative grant supplement was awarded to EDGE, in partnership with the University of Arizona Southwest Environmental Health Sciences Center. This Supplement grant supported conversations in tribal communities to collect American Indian environmental health stories. The primary purpose of the original project was to identify the core concepts of Native Environmental Health Science, as distinct from the mainstream western understanding of the discipline. Supported the development and piloting of a class on community-based participatory research methods at NWIC. Created a written survey exploring perspectives on the relationship between health and the environment, important issues within native communities, and the prospect of collaboration with larger universities. Adapted the written survey for use in two student-facilitated talking circles at NWIC. Administered the written survey to over 100 tribal college students and staff at the American Indian Higher Education Consortium (AIHEC) student conference in Missoula (March 2009), 30 different tribal colleges were represented. Jointly analyzed the qualitative data we had collected and identified several underlying themes and three core concepts of Native Environmental Health. Used these themes and concepts to create a traditional story called "The Return" as a way to report our findings back to our communities. Supported two NWIC student interns who created a short photo-montage film based on "The Return" story. Hosted a series of informal discussions with elders and the NWIC community, culminating in a presentation of "The Return" to a gathering of over 100 elders. Presented our findings at two national and one international Native health research conferences. Returned to the AIHEC Student Conference in 2011 to share the movie of "The Return" with that community as a way to bring the project full circle. In partnership with a young artist from the Institute of American Indian Arts (IAIA), created a comic/coloring book version of "The Return" and distributed hard copies to NWIC, IAIA, and at the 2013 AIHEC student conference in Green Bay (March 2013). 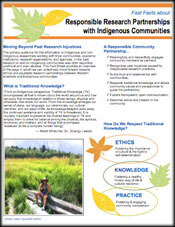 Created two "Fast Facts" sheets: Responsible Research Partnerships with Indigenous Communities and Indigenous Cultural Autonomy: Decolonizing Autonomy to Transform Research Practices. Solicited original artwork for two "Native Environmental Health" posters based on our research findings. Identified Native researchers from the Puget Sound region to hold discussions about environmental health in their communities as part of the 2013-14 Supplement Grant, American Indian Environmental Health Stories. The Native researchers held conversations in their own tribal communities, in tribal college classes, a Moms group, art show, among the Native TEACH researchers, and throughout tribal communities. Created a 10-minute Native TEACH Digital Story that features the researchers and their projects. Supported the University of Arizona in their work with the Tohono O’odham Nation. They conducted a Leadership School summer Environmental Health Sciences course with high school students at Ha:san Preparatory School, and worked on research related to high arsenic levels on the reservation. Their culminating product is a magazine, Indigenous Stewards, that reports on the American Indian Environmental Health Stories Project in Arizona. To learn more about current partnership activities, please contact Liz Guzy (eguzy@uw.edu, 206-685-5333). If you would like to receive hard copies of any of these posters (subject to availability), please fill out the online form here. 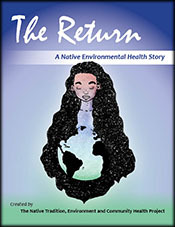 The Return: A Native Environmental Health Story (Comic & Coloring Book, PDF 6.1 MB). 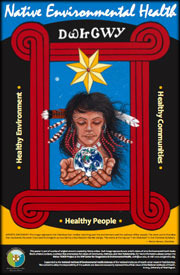 Native Environmental Health Poster (Cherokee Version, PDF 2.69 MB). 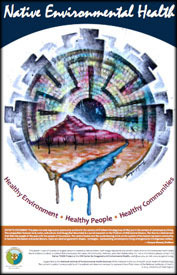 The poster is designed to be printed on "ledger" sized standard paper (11" by 17") Native Environmental Health Poster (O'odham Version, PDF 2.79 MB). The poster is designed to be printed on "ledger" sized standard paper (11" by 17"). 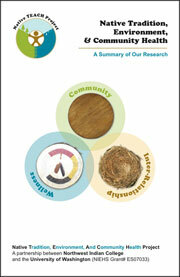 Fast Facts: Responsible Research Partnerships with Indigenous Communities (PDF, 636 KB). 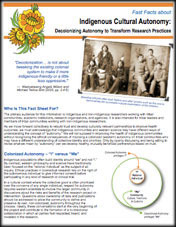 Fast Facts: Indigenous Cultural Autonomy: Decolonizing Autonomy to Transform Research Practices (PDF, 310 KB). Native TEACH Project Brochure (2011). (PDF, 1.4 MB). Includes the full text of the original version of the story of "The Return." "The Return" grew out of a research project conducted by the Native Tradition, Environment And Community Health (TEACH) Partnership in Washington State. The NIEHS EDGE Center-- then called the Center for Ecogenetics and Environmental Health and Northwest Indian College (NWIC) collaborated on the project. The film presents a traditional story, read by a student from NWIC and accompanied by images taken by NWIC student interns. The research project sought to identify the core concepts of environmental health in a Native context. These three concepts are presented in the film, along with barriers to achieving health and wellness in Native communities.